First Impressions of the Yamaha PSR-S770. The widescreen effect is the first visual difference you notice , compared to the 5" Black and White square screen of the PSRS750, the 7 inch TFT Color Wide VGA LCD screen of the PSR-S770 certainly looks sleeker , more modern , clearer and lesss cluttered than its predecessor. There are over 152 extra sounds on the S770 when compared to the S750, although obviously the quality rather than quantity of voices is more important , as a general rule the "SA" or "Super Articulation" are amongst the best voices , in this respect the S770 has nearly double the SA voices of its predecessor. Its not all about SA voices though there are some excellent new voices in all the other categories , such as mega , sweet , cool and live voices and 10 more organ flutes. 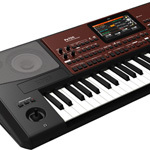 Previously only the Tyros models have the capacity to have a sensible amount of expansion , the S770 now has 160mb of sample memory, its not nearly as much as the 512mb available on PSRS970 but customers will be able to purchase some "tyros type " expansion packs from www.yamahamusicsoft.com . In addition you can also import third party samples such as those supplied by www.ttt-sounds.com. If anyone has any difficulty in downloading or using their packs all AC Hamilton customers benefit from friendly help and technical support from our affable technical whizz kid Mr Keith Rawlinson whose patience is limitless when coming to the aid of our customers. You will notice that on the extreme left hand side of the keyboard there are 2 new knobs , these are live controllers , these can be used to choose from the numerous new arpegggiated synth phrases. This is an interesting one , the new DJ styles have a pre programmed chord progression, so your left hand isn't stuck to the keyboard.